I’ve mentioned Lenny’s Sub Shop before, but one thing I didn’t mention is their impressive use of social media in their marketing. Now, if you’re anything like me, the phrase “social media in marketing” makes you cringe, as it reeks of obnoxious, invasive posts on Facebook and Twitter begging you to please please please try their product. Lenny’s usually manages to avoid this. Instead, they post weekly “Social Wednesday” deals on subs and combos on Facebook, with coupons good for that day. Lenny’s also runs occasional giveaways, like haiku or picture contests, with the prize being a $10 Lenny’s gift card. I was lucky enough to win one, so I headed out to pick up a sub. Unfortunately, they don't offer whole tomatoes as a side (as far as I know). Looking back, I should’ve been more adventurous, but I decided to go with an old favorite, the Philly Cheesesteak. I have no complaints. The steak was thin sliced and grilled to perfection, and the cheese and onions were great. The only thing I would have done differently would have been to ask for the hot pepper relish on the side, the way I said I would last time, but I forgot. It’s good, and would be a nice addition to an Italian sub, but it overpowers a cheesesteak a bit. The cheesesteak cost around $6.50, well within the gift card’s balance. I’d recommend it, but more than that, I’d recommend becoming a fan of Lenny’s on Facebook. It’s quick and painless, and you might end up getting a free sub or two out of it. 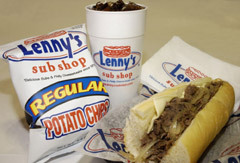 Lenny’s Sub Shop is a relatively new sub sandwich chain. It’s kind of a cross between Subway and Jimmy John’s, in that it offers both hot and cold subs, as well as salads, chips, and cookies. They’re also well-known for their “hot pepper relish,” which you can get on sandwiches and in jars. I had a coupon for a free sub, so I decided to check it out. This isn't the meal I got. Mine was a Chicken Philly. But there aren't any good pictures of that online, and frankly this meal looks delicious. I decided to go with a hot sub, to get my money’s worth as it were. I selected the Grilled Chicken Philly. It consisted of diced chicken, onion, swiss, and some hot pepper relish (my own addition). It was pretty good! The chicken and onions were cooked to perfection, and the hot pepper relish was nice and flavorful. I might ask for a little bit less of it next time since it’s a bit strong, but I wanted to try their signature relish, and I wasn’t disappointed. As I mentioned, I got my sub for free, so I’d definitely recommend doing that. Their sandwiches are about the same price as Subway, and about the same, if not a bit better quality. The staff was also friendly and engaging, at least at the location I visited, which I haven’t always seen at Subway. I’d recommend giving Lenny’s a try for your next casual lunch out.